We ship furniture that's boxed or unboxed, we ship furniture that's brand new, and we ship furniture that's been in the family for generations. 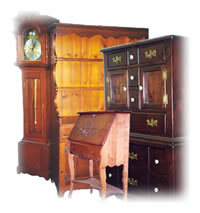 We ship antiques, items sold on eBay, you name it - if you need to ship furniture, call Pak Mail La Jolla. Pak Mail is ideal for those who need to send just one or two pieces of furniture; too small for a moving company to handle but just right for Pak Mail. Our personal approach means that we clearly explain your shipping options to give you the best value for your situation.